Complete your ultimate rig for the future of games with the Radeon X1900 CrossFire Edition the fastest consumer multi-GPU gaming platform on the planet. With its ultra-threaded engine an unparalleled shader performance, the Radeon X1900 CrossFire Edition delivers maximum graphic detail at incredible frame rates. 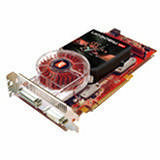 To complete the CrossFire platform, a PCI Express Radeon X1900 graphics card and a CrossFire Ready motherboard are also required.